The Honourable the Chief Justice of the Supreme Court of India, Mr Dipak Misra. The Honourable Chief Justice of the Supreme Court of India Mr Dipak Misra was the University of Southampton’s special guest and delivered the first of a series of Southampton-India distinguished lectures, 'The Emerging Jurisprudence of Constitutional Ethos and Constitutional Morality: Indian perspective' to academics and students. 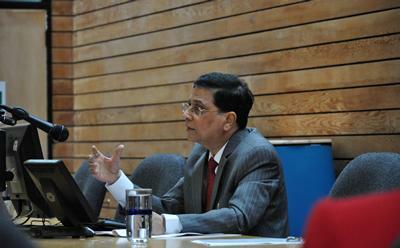 During his talk, Justice Misra explained how independence in India and the adoption of the constitution created the concept of the 'citizen' and the elimination of the concept of 'subject' – putting the rulers and the ruled on an equal footing. “The Indian constitution is an organic document and must therefore reap and grow on the bedrock of constitutional morality” he added. Through his lecture he talked about how the courts, in particular the Supreme Court of India, made rulings on the constitution over the decades following independence. This high profile visit underlines the strong relationship that the University of Southampton has cultivated with academic partners in India over the past two decades. There are many research projects being carried out between the University and a variety of Indian higher education institutions from New Delhi to Kerala. This includes a multimillion pound project to address the impact of climate change on the livelihoods of farmers in the delta regions of Indian Bengal, Bangladesh and Ghana, working with Jadhavpur University and the National Remote Sensing Agency in India. Other projects include examining ageing and wellbeing and studying inequalities in access to health care. Students had the opportunity to ask Justice Misra some questions at the end of his talk and the warm reception he received reflected how valuable his talk was in furthering their understanding of constitutional ethos and morality.